With a gazillion cable channels and the ability to record and fast forward through the ads, satellite radio and personal music players, the increasing replacement of the Yellow Pages by the Internet, and the decline of newspapers, many traditional marketing methods are falling by the wayside. One, however, remains. It's direct mail. Plumbers often complain about direct mail. It's no wonder — most plumber direct mail stinks. Here are 10 tips to improve your direct mail results. This is a nice presentation on lean management, which can be applied by companies of any size. Essentially, view every activity through a customer prism. Does it improve the value proposition for the customer? If not, why are you doing it? Whenever I attend a trade show, there's guaranteed to be one or more booths with "booth babes," who are local models or actresses hired to dress provocatively and stand in an exhibitor's booth. Why are they there? Presumably, booth babes attract prospects to the booth. In reality, they attract suspects... people suspected of being buyers, but who come to the booth to look at the booth babes, not to buy. As a rule, booth babes hurt exhibitors. Real prospects are looking for information. Booth babes and the people they attract simply get in the way, driving prospects to go away. Some prospects will avoid the booth simply because they don't want anyone to even think they are attracted by the booth babes. This is especially true if the prospect is male and attending the show with a spouse. Visiting a booth with booth babes conflicts with the value system of others. Seriously, I've heard plumbers complain openly about a woman "on display" at a plumbing show. And the plumbers who were complaining ran large companies. They were the heavy hitters every exhibitor wanted. Another issue with booth babes is the effect on an exhibitor's staff. I've seen the staff focused on the booth babe rather than the prospects. Face it. Booth babes are a distraction. They may attract a crowd, but not the right crowd. Ditto for celebrities or a hot sports car, which is the mechanical equivalent of a booth babe (unless the car is being given away at the show). There are exceptions. The exceptions are when the booth babe is part of a live marketing program that reinforces the message of the booth. An example is the cave woman hired by Juan Cardona (JC Heating and Cooling in Crossroads, WV) who pops out of a cave he creates to reinforce the Jurassic air conditioner theme, encouraging homeowners to register for his oldest air conditioner contest. Click here to download a free turnkey oldest appliance kit from the Service Roundtable. "I have nothing interesting to offer so I'm using a booth babe to drive traffic." "I think so little of my prospects' intelligence, character, and motivation that I believe a booth babe will drive sales." Whether at a trade show or a home show, booth babes are distractions. For here am I sitting in a tin can… Your circuit’s dead, there’s something wrong. Standing there alone, the ship is waiting. All systems are go. are you sure? Watching in a trance, the crew is certain. Nothing left to chance, all is working. "Send me up a drink. ", jokes Major Tom. Starting to collect requested data. "What will it affect when all is done?" "Hello Major To,. are you receiving? "Give my wife my love." Far beneath the ship, the world is mourning. They don't realize, he's alive. No one understands, but Major Tom sees. this is my home, I'm coming home." Why promote the technological advancements of a car with a song about the technological failure of a spaceship? Did any executives at Ford listen to the whole song before giving the agency approval? Apparently not. 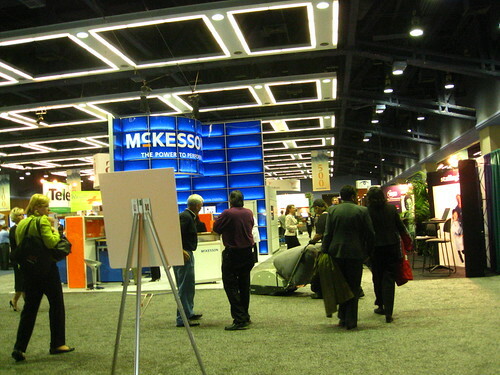 It's expensive to attend a trade show or home show. The costs ratchet up with each increase in the size of the booth and the number of employees attending the show. So why do so many exhibitors ignore prospects? Yesterday, a team from the Service Roundtable spent nearly seven hours at the AHR Show in Orlando. We were focused. We had an agenda and a mission. We were very conscious of time. Yet, time after time, we walked into booths and were totally ignored by exhibitor employees who were engaged in conversation with each other! The most irritating instance was the employee who was actively engaged in deep conversation with the rented "booth babe" while ignoring us (more on "booth babes" later). To get the attention of employees at some booths required us to interrupt the employees' conversations. As a rule, these tended to be the biggest booths with the most employees. I can remember two instances of actually thanking people for taking the time to talk with us. Why exhibit at all if you're going to ignore (and irritate) prospects? I had to catch a 6:20 a.m. flight to Orlando this morning, which meant I was in the airport around 5:30 a.m., looking for a place to grab breakfast. My choice was McDonald's or... um... well... nothing. McDonald's was the only restaurant that was open. None of the others looked close to opening. I doubted any would open before 6:30 a.m. at the earliest, leaving McDonald's with a competition free hour. What a dirty trick by Mickey D, staying open longer hours than the competition! Given the length of the line in front of McDonald's, I suspect any other restaurant would peel off one third of McDonald's customers based on the line alone. The restaurant owners/managers don't even know how much business they're missing by not opening an hour or two earlier. 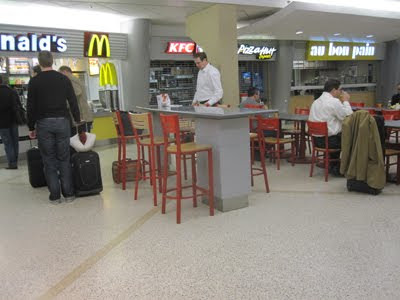 A lack of operating hours does not only affect airport fast food. It also impacts service contractors who do not want to stay open an hour or two later or who seek to avoid Saturday service. Like the closed fast food restaurants, they have no idea how much business they're losing. If a homeowner loses a water heater Friday evening, calls your company and gets an answering machine, do you really think he's going to wait until you get around to calling him back sometime on Monday? Some service contractors make a conscious decision to shut down at 5:00 p.m. and on the weekend. This is okay if the company has plenty of business during normal operating hours and can accept losing emergency service. However, contractors who complain about a lack of business while limiting hours can only blame the guy in the mirror. This short video uses the words of Roger Bannister, talking about running a 4-minute mile in a dramatized fashion. Bannister's words are equally applicable to life, which is the point of the video. Watch it. It's good. On this page two years ago I wrote, “What if it doesn't get warmer? What if it gets colder?” After a summer that wasn't and one of the coldest and snowiest winters on record, it certainly seems to be getting colder. 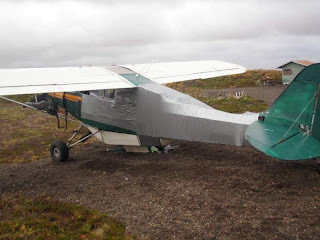 Showing once again that duct tape can do anything except fix ducts, Alaskan pilot, Luke Miller used it to repair a plane. 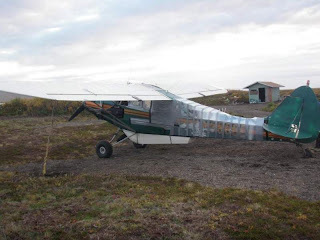 Miller decided to stop overnight at friend, Gary LaRose's hunting lodge last September. 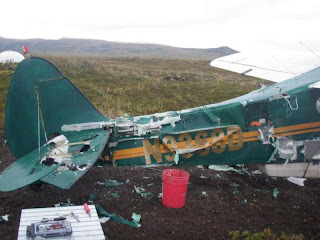 Unfortunately, LaRose had been having problems with a brown bear. 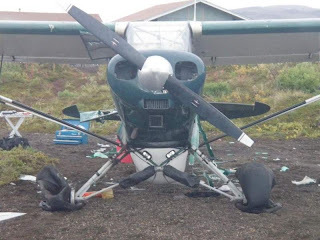 Earlier the bear had broken into a meat shed, helping itself to 60 to 70 pounds of fresh moose. Once again, duct tape saves the day. It just cannot save your ducts. 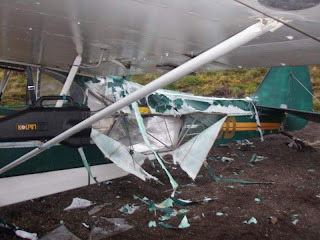 You can fly a plane held together with duct tape. You just cannot hold ducts together with duct tape. 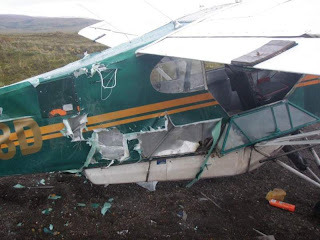 Thanks to Greg McAfee for the heads up about this one. Higgs quotes economists and historians to support his points that uncertainty freezes investment, the Roosevelt administration created an environment of uncertainty, and business investment stagnated during the Depression. In an economy where entrepreneurship is decentralized, economic actors will hold back on long-term investments unless the state makes credible commitments to honor its contracts and respect individual ownership rights. Investment spending on an aggregate level may be highly sensitive to risk in various forms…[including] uncertainty over future tax and regulatory policy… a major cost of political and economic instability may be its depressing effect on investment. What does provide some degree of protection is the political system, together with the economic pressure groups that ensure that the state does not go ‘too far’ in interfering with the owner’s control over assets. This politically determined thin line may be understood as the real definition of property rights conferred by the state, as distinct from the somewhat fictitious legal notion of property rights. How broadly property rights are defined in this real sense and how effective states’ (largely nonlegal) commitment is to their security is a more serious problem than the issue of legal protections against the more traditional form of takings. [The Roosevelt administration] abruptly and dramatically altered the institutional framework within which private business decisions were made, not just once but several times with the result that regime uncertainty was heightened and recovery substantially retarded. [Businessmen in the 1930s] are not only, but they feel threatened. They realize that they are on trial before judges who have the verdict in their pocket beforehand, that an increasing part of public opinion is impervious to their point of view, and that any particular indictment will, if successfully met, at once be replaced by another. Uncertainty rules the tax situation [in the 1930s], the labor situation, the monetary situation, and practically every legal condition under which industry must operate. Are taxes to go higher, lower or stay where they are? We don’t know. Is labor to be union or nonunion?… Are we to have inflation or deflation, more government spending or less?… Are new restrictions to be placed on capital, new limits on profits?… It is impossible to even guess at the answers. For the most part the New Deal relied on private investment to stimulate recovery yet its rhetoric precluded the private confidence to invest. [Roosevelt] lost patience with corporation leaders, and younger New Dealers came to the fore who shared his reluctance to make concessions to conservative business opinion.… The men around Roosevelt were now highly skeptical of the ability of business to act in the national interest. Business leaders sincerely believed that the government was in evil hands…and preparing the way for socialism, communism, or some other variety of anti-Americanism. The failure of the New Deal to bring about an adequate revival of private investment is the key to its failure to achieve a complete and self–sustaining recovery of output and employment. Perhaps the New Deal’s greatest failure lay in its inability to generate the revival in private investment that would have led to greater output and more jobs. A similar, though milder form of regime uncertainty, characterized the United States in 2009. The government nationalized most of the automotive and financial sectors, shoved an increasingly unpopular health care bill through the House and Senate that threatens to nationalize another sixth of the economy, rammed cap & trade (i.e., cap & tax) legislation through the House, created a pay czar to dictate private sector compensation, intends to pass union friendly “card check” legislation, is allowing tax cuts to expire, which essentially means a tax hike, and generally spewed anti-business rhetoric more worthy of Hugo Chavez than the U.S. government. Much of the uncertainty ended last night with the surprise election of Scott Brown in the Massachusetts special Senate election. Brown provides a critical 41st vote to block cloture and allow the minority to filibuster legislation in the Senate. More important than the vote is the message Brown’s surprisingly strong election sends to moderates. If the GOP can take a Massachusetts Senate seat by a five point margin (i.e., it wasn’t close), all moderates in more conservative areas should be concerned. Moderates now fear the voters more than their party leadership. Since politicians tend to put their self-interest first, this reduces the risk of passage of significant legislation that will fundamentally alter the business environment. While the administration’s pursuit of Keynesian economic policies will likely hinder, rather than help a recovery, this is a headwind that can be overcome. The United States has always attracted business investment from around the world for our political and economic stability, reliance on the rule of law, and property rights. With regime uncertainty reduced, expect investment to increase. The business climate just took a tick up. Not only can plagiarism cost your company; it can cost you, your company. That’s right; you can lose your company over plagiarism, even without malicious intent on your part. Click for the full article at Contracting Business by Charlie Greer and Matt Michel. Forward this one to your mail list. Every business owner needs to be aware of the risk from using plagiarized material. It's a myth that business is opposed to government interference in the economy. It's not. Business leaders love government interference. They love regulations. They love tariffs. They love them as long as they benefit their companies and/or penalize their competitors. There are business leaders who will always seek to win politically what they are unable to win in the free market. You can often spot them on television, providing cover for the politician who is introducing some new law that reduces liberty, weakens the free market, and provides a drag on the economy at large, but that helps the business leader's company. The term for this behavior is "crony capitalism." It's hard to fault business leaders who try to game the system. They're simply choosing the easy path to maximize shareholder value. It's cheaper to buy politicians than to buy share in a free market. It's up to principled politicians to resist the seductive embrace of the crony capitalist. Unfortunately, politicians too often serve their self-interest rather than the public interest. They distort the free market by tilting the playing field in the direction of a favored few. As government increases in size and scope, its ability to influence business increases. Market competition takes a back seat to political connections. Companies with branding programs seize control of their future. They build equity into their name, not another's name, not a name that's rented to them, loaned to them, or that can be offered to another company somewhere down the road, after the contractor's built up the name. While imitators are arising, there is only one original, turnkey branding program in the HVAC industry. That's the Retail Contractor Coalition. The Retail Contractor Coalition offers the most deliverables, the most guidance, and the best expertise in the industry on branding. It's the only program designed by an internationally recognized branding expert in collaboration with a team of leading contractors. The President of the Retail Contractor Coalition is Ben Stark, who is the Contractor of the Year for North Texas ACCA. The Vice President is Steve Miles, named National Contractor of the Year by Contracting Business Magazine. On February 1 and 2, you can attend Brand Day FREE of charge in Houston, Texas. Get to Houston and the hotel, meals, and local transportation is FREE. Learn more about contractor branding. Learn how you can not only join the Retail Contractor Coalition and start branding your company for FREE, you can actually make a profit from it (though we urge you to reinvest this profit in your brand building activities). For more information, call Liz Patrick toll free at 877.262.3341. Hurry! Reserve your place today. During a contractor panel, Ben Stark was asked how much he budgeted for advertising and marketing. The contractors were interested because Ben built a large, prosperous company in a relatively short time. He employs over 30 people and has over 3500 service agreements. Ben said his target was 6%, but laughed at the number. In 2008, he spent 8%. Last year he spent 9%. He went on to explain that he bumped his advertising because of the economy. Good companies do that. They spend more on marketing during times when it's harder to find customers, not less. To retrench is to spiral down. Ben noted that he's spent a much higher percentage than today. When he was starting out, marketing consumed 14% of his sales. If you're in a services business, you might want to bump your starting point higher than 5%. For example, like most professional services firms, my company is more margin-oriented than volume-oriented, so fueling its growth requires that we spend a higher percentage of our revenues. Last year, our number was just over 8%, and I've seen companies spend upwards of 15% when warranted—especially young companies that need to invest to build their brand. Volume-driven companies tend to spend a tiny percentage of sales on marketing, in part because their large revenues enable small contributions to add up fast, and in part because of the margin pressures they face in having to compete with other high volume companies. By contrast, margin-driven companies tend to spend a larger percentage of sales on marketing: They have room in their margins to afford it, and they're often working from a smaller revenue base. The bigger question might be, "How do you spend it?" The first two, getting and keeping customers, are obvious. Increasing your average ticket? Actually, this can be one of the most important marketing efforts you will make. Increasing your average ticket means dropping more to the bottom line on every call. You can increase your average ticket by marketing add-on products and services on service calls. The marketing investment might be limited to producing a series of flyers for distribution to the customer in the field. Or, you could produce a full-fledged DVD explaining the wonderful things you can do for the customer and ask the customer to play it during the diagnostic or repair. You can increase your average ticket by using financing to lower the monthly payments for homeowners so they are able to spend more. Every addition gross profit dollar drops straight to the bottom line. The marketing investment might be to buy down the interest rate or to offer 12 months same as cash. How much you allocate towards each of the three areas of focus depends on the nature and position of your company. If your company is established, with lots of loyal customers, you will probably spend more on retention than acquisition. If your company is in a growth mode, you will stress new customer acquistion. And everyone should try to increase the average sale. What's your marketing budget for 2010? What percent will you spend on customer acquisition? On retention? On increasing your average ticket? How much per month? You can build your own spreadsheet, allocating your budget by month, focus, and ultimately program. The result is a marketing calendar designed specifically for your company. Shameless plug... The Service Roundtable recently created a Marketing Planning Wizard for HVAC and Plumbing that streamlines and simplifies the process, guiding people step-by-step. It comes with the standard $50 monthly membership. If you're a plumbing or air conditioning company, check it out. Or call Liz Patrick, toll free at 877.262.3341 and ask or a free tour. When is your Black Friday? With it is the being of a New Year, it signals new opportunity to have learned from last year’s pain or be forced to repeat it. During December, I spoke to several contractors who were not profitable for the year; one said he said he was waiting for his Black Friday. The concept of Black Friday in the retail business has not been around for a long time. According to Wiki it was originally coined in Philadelphia in 1966 and had to more with traffic in the central area of the city the days after Thanksgiving till Christmas. About 15 years later was morphed into representing the day on an annual basis that a retail organization went from an operating loss to a profit. The truth is that most retailers make a profit every quarter. Are you making a profit every quarter, month, week or every day? All businesses even seasonal ones should have a goal to be profitable all the time. The thinking that at a given date in a year, you have covered your expenses and the subsequence revenues are all profits is a head in sand approach that could lead to disaster and failure. If you are looking in terms of a year for your horizon, you will miss the chances to preserve the hard fought wins while accepting what falls into and/or off your lap. With the advent of (1)accounting software like QuickBooks, Peachtree and MYOB to name a few, the ability to manage your business is a mouse click away. Industry specific add-ins makes these tools even more effective. Twenty years ago it took a programmer to generate a report with limited flexibility, now you can make your own report in matter of minutes. To keep the reports accurate you need the information to be current. It is no longer acceptable to batch items and wait on a schedule. Here is where (2) “Lean Accounting Processes” and (3) “Single/One Piece Flow” pay large dividends. You get an invoice, to put it in the system, you get new order you put it in the system, you finish and ship product/service you invoice immediately. At the end of day a person’s desk is clear and is waiting for the new work of the next day. In essence whether you large or small you can have a reasonable snap shot of the day’s performance, and at the end of the week you should be reviewing the KPIs(Key Performance Indicators) AND THEIR TRENDS. KPI’s will differ for each company, but reflect the elements that most important in the life of that entity. Some standards, Cash, Days of AR, AP, WIP, GM, Projected Net Profit and a 13 week cash flow projection. Back to the original question when is your Black Friday? My answer to you is; Every Friday should be your Black Friday. Because if it is not Black then you have something to be working on to correct that next week, not next year or even next month. This information should be shared with the managers along with the expectations for performance and goals. In a perfect situation the managers will react to correct the issue before the owner or superior has to motivate them. This is a goal for your organization to obtain. 3 One Piece Flow refers to the concept of moving one workpiece at a time between operations within a workcell. At the opposite extreme, we might process an entire batch or lot at each operation before moving it to the next operation.